The wonderful thing about horseradish sauce is that it's such a complete departure from the sorts of rich, buttery, creamy sauces you might otherwise serve with roast beef — think demi-glace or Béarnaise. 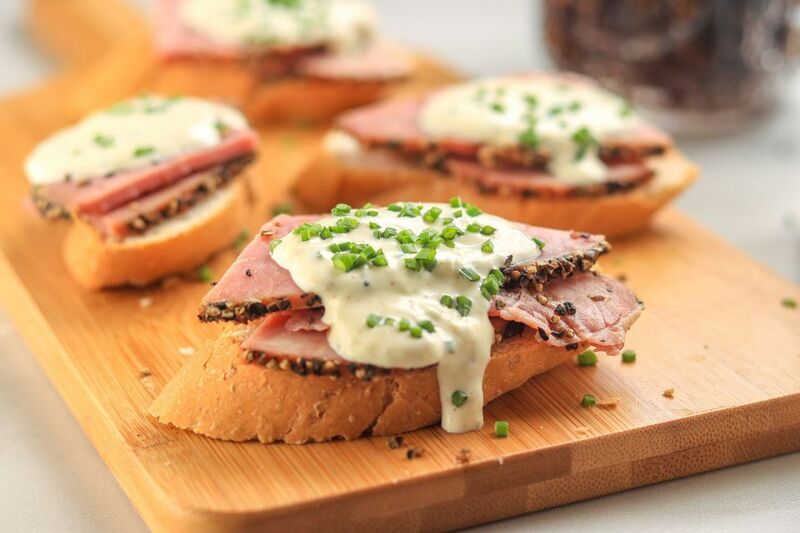 Horseradish with roast beef takes things in another direction altogether. With its biting heat and whiff of pungency, horseradish utterly disrupts the flavor of the beef, distracting you just long enough to focus your awareness, and an instant later you're back to tasting the beef again — but it's like you're tasting it for the first time. Horseradish with beef helps keep each bite interesting. Which is important when you're enjoying a generous serving of prime rib. The palate craves contrast, or it eventually goes into sleep mode — no matter how delicious the food might be. Then, sort of as a contrast to the contrast, sour cream cools the palate while contributing its own creamy, tangy richness. Refrigerate for at least two hours to let the flavors come together. About 15 minutes before you want to serve it you can take it out of the fridge and let it sit at room temperature so it isn't ice-cold. If you grate your own horseradish, it's going to be much hotter than store-bought. So while this recipe calls for 1/4 cup of prepared horseradish, you might want to start with half that if you make your own and add more if you need it. "Prepared horseradish" is grated horseradish root that has been mixed with vinegar to maintain its flavor. Generally speaking (unless, say, the writer specifically describes peeling and grating raw horseradish root), when a recipe calls for horseradish, they're referring to prepared horseradish. You can easily prepare this recipe using freshly grated horseradish root, though. Peel the root and cut it into chunks small enough for your blender or food processor to handle, the process until it's finely chopped but not completely pureed. The vapor can burn if you breathe it, so be careful when you remove the lid. Once it's processed, pour in a bit of vinegar and stir. You just want horseradish uniformly moistened by the vinegar. You can keep it in a jar in the fridge for a few weeks, and you can also peel any unused horseradish root, cut it into chunks, wrap them individually and freeze.